Browse our huge range of clear, plain polythene bags, available in 25 different sizes and in three strengths to suit your requirements. Suitable for packing anything from instruction booklets, pet food, candyfloss or kindling. If you need help finding the right bag for you, take advantage of our free sample service. All our polythene bags are food safe so you can be secure in the knowledge that your tasty treats can be enjoyed by your customers, without worry or additional preparation. Consider tying them with a bow or using a branded sticker to complete the look. Please note that measurements of our plastic bags can vary slightly by several millimetres due to manufacturing tolerances but this will not affect the structural integrity of the packaging. 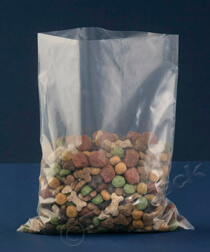 We have Light duty polythene bags which are ideal for sweets, small accessories, beads and wires, Medium duty polythene bags, which are perfect for cereals, dried pet food and paper/cardboard products, and Heavy duty polythene bags, which are commonly used by builders for sand and other similar products. 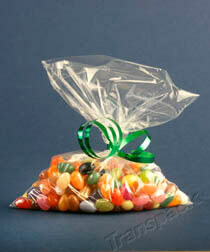 All our polythene bags are available at wholesale prices and come with additional discount for buying in bulk. With 5% online discounts at already low prices, you’ll get the products your business needs and save with Transpack. 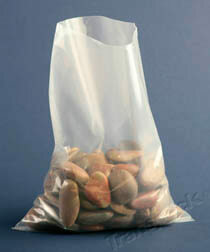 For more information, watch our video about "Clear Polythene Bags" to see the best uses for each bag type. We recommend using the full screen option to see in the best quality and, should you need it, there is a transcript available for the video, simply click ‘Read transcript’ under the video.